To ward off the gloom of these dark December days, I’m taking a look at a painter whose work simply celebrates the joy of life. 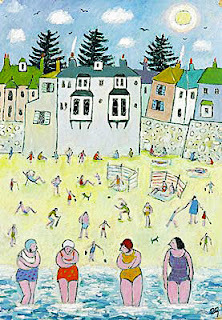 Joan Gillchrest moved to Mousehole from London in 1958. She was able to buy a cottage overlooking the harbour by selling a sapphire ring and sable coat that she had inherited. 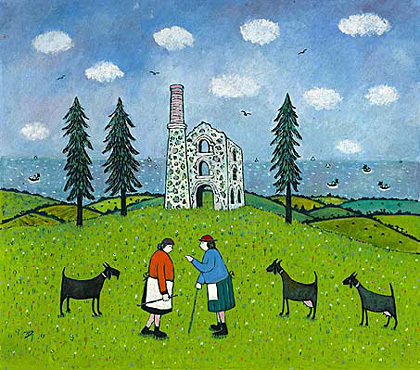 Joan's partner and fellow artist, Adrian Ryan, had introduced her to Cornwall some years earlier. He had many friends in the area including Betty John, daughter-in-law of the painter Augustus John. Joan was a strong-willed character who did not suffer fools gladly. The couple’s co-habitation in Mousehole must have been tempestuous. Intent on consolidating his status alongside St Ives figures such as Peter Lanyon and Patrick Heron, Adrian dismissed her painting as ‘gimmicky’. He is reported to have turned her paintings to the wall if he expected important visitors. While Joan enjoyed a lively social life with Adrian, mixing in artistic circles, by 1965 she had had enough, and ended the relationship. Liberated from her partner’s disapproval, she was at last able to express herself without constraint, developing a unique style which recorded the everyday lives of ordinary people with empathy and humour. For the next half century Mousehole and its surrounding area became the inspiration for her paintings. Joan was born into a wealthy family in 1918. Her paternal forbears included several distinguished architects. Perhaps the most well-known was her great-grandfather, Sir George Gilbert Scott, responsible for such iconic landmarks as the Albert Memorial and St Pancras Station. Her father was an eminent radiologist, with a propensity for sketching caricatures. Her mother, an accomplished pianist, was from Australia. At the age of 15, with her parents’ encouragement, Joan was allowed to leave home to experience life in Paris. Returning two years later, she enrolled at art school in London and in 1936 exhibited a still life at the Royal Academy. On the outbreak of the Second World War Joan volunteered as an ambulance driver. Marriage to Samuel Gillchrest, a barrister, entailed a move to Pirbeck, where he was stationed for the remainder of the war. Her husband’s social standing and the demands of motherhood combined to curtail her artistic ambition. The marriage was short-lived and in 1953 she found herself having to support her two young children. A strikingly attractive woman who combined elegance with bohemianism, Joan became sought after as a fashion model. Later, living in Chelsea, she worked as an artist’s model. It was here that she met Adrian Ryan. Her love affair with the town and people of Mousehole lasted fifty years, ending with her death in 2008. During this period she witnessed great changes, such as the reduction of the fishing fleets and the closure of the mines. A fascination for architecture is integral to Joan’s paintings. Many of the churches and chapels of the Penwith peninsula appear in her works, as do the engine houses, a poignant reminder of a vanished way of life. 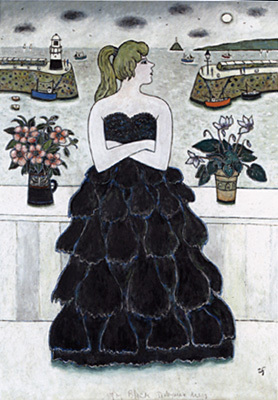 While Joan admired the work of Alfred Wallis and Christopher Wood, she could not be described as a truly naïve painter and consequently her work, while popular, failed to achieve critical acclaim. She painted in order to give people enjoyment, rarely visiting exhibitions. According to the artist she had no wish to be influenced by the work of others. Her first solo show was held at Plymouth Art Gallery in 1969 and from the early 1970s onwards she was represented by the Newlyn Orion Gallery. There was an introspective element to her art, which found expression in works commemorating events such as the Torrey Canyon oil spill of 1967 and the Penlee Lifeboat disaster of 1981. These tragedies affected her deeply but were so personal to her that her canvases on these subjects were never exhibited in public. Joan was bemused by the demand for her work. Her exuberant spirit and involvement in the local community are qualities very much in evidence in paintings which reveal her warmth and compassion. In later life she became somewhat reclusive and shunned publicity. 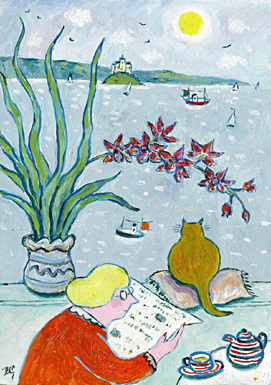 She was happiest painting and spending time in her conservatory, surrounded by an abundance of plants whose profusion at times threatened to obscure the wonderful view of the harbour below. At Christmas, Mousehole becomes a magnet for visitors from far and wide, drawn by the spectacle of this picturesque port, lit up every evening by a chain of lights. These are strung from house to house, right round the harbour, embracing the community in a unique mid-winter celebration. The custom began in 1963, when Joan Gillchrest decided to hang some festive lights across the front of her house. The idea caught on, and today her grandson Sam is among the volunteers responsible for maintaining this tradition. Further reading: Joan Gillchrest : A Life in Pictures by Gill Mitchell, published by Wren Gallery. 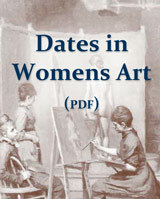 An exhibition of sketches by Joan Gillchrest takes place at the Wren Gallery in January 2011.